Amazon CEO Jeff Bezos thinks e-commerce may not always be the company’s biggest business. According to Amazon SVP Andy Jassy, Bezos believes Amazon Web Services (AWS) — the company’s cloud business, where it rents out its computers to other companies to run their own web sites and apps — could someday become the biggest business at Amazon. There are reasons to be sceptical about this. 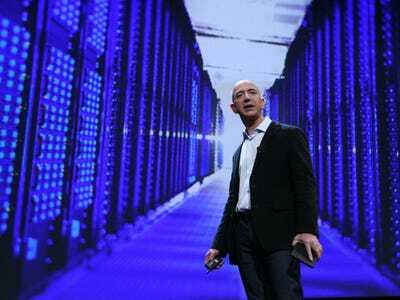 Today, AWS is dwarfed by Amazon’s e-commerce businesses. It counts as part of the “Other” category, along with ad revenue and some other things. That category made up only 7% of Amazon’s revenue last quarter. Also, cloud services are currently a low-margin business requiring a lot of investment. Amazon’s two biggest competitors in the space, Microsoft and Google, have other immensely profitable businesses they can use to subsidise their cloud attack. Amazon may be way ahead today — it has 27% market share, compared with number-two Microsoft at less than 15% — but Microsoft, Google, and IBM are all growing faster, according to the latest market share figures from Synergy Research Group. Does Amazon really have the commitment to fight this battle to the end? Absolutely, if you believe what one Amazon engineer says. EnterpriseTech reported on a recent talk given by distinguished AWS engineer James Hamilton. In 2004, Amazon’s entire e-commerce business took in about $US7 billion in revenue, about one-tenth the amount it takes in today. In 2014, Hamilton said, Amazon adds enough new data center capacity every day to support its entire 2004 business. That’s right — Amazon is basically taking all the technical resources it needed to support its entire business in 2004, and adding that amount as brand new capacity, every day. Another way of looking at it: In the last year, Amazon has added enough capacity to support more than $US2.5 trillion worth of e-commerce transactions, if it had to. It probably won’t have to do that any time soon. Total U.S. retail sales in 2014 will be around $US1.6 trillion — not just e-commerce, but all retail sales, total. A lot of this investment has gone into nuts and bolts improvements to its infrastructure, like speeding up the private network between its data centres, which reduces bottlenecks and keeps performance relatively zippy. Amazon can pass the benefits of those improvements onto its AWS customers. Amazon probably won’t be able to go as far as Microsoft and add full hosted applications, or software-as-a-service (SaaS). Microsoft already has millions of customers for products like Office and Exchange, and those customers may not need much persuading to move those apps to Microsoft’s cloud. Amazon doesn’t even play there today. But overall, when it comes to cloud computing, Amazon is the clear leader today, and it’s not letting up on its investment at all. One more point: there may be room for a lot of winners in this space. Today, companies spend more than $US3 trillion on information technology every year, according to Gartner. A lot of that money is still being spent on software and hardware that companies run themselves, in house. But over the next decade, some chunk of that spend will move to cloud services. Amazon thinks nearly all of this spend will move to the cloud because most companies are not in the information technology business. They’re there to sell aeroplanes, or real estate, or fast food. Those companies are never going to be as efficient running their own data centres as huge Internet-focused companies like Amazon, Microsoft, and Google are. For these companies, outsourcing most of their IT to the cloud makes basic sense. Even if Amazon doesn’t dominate cloud services forever as it does today, $US3 trillion is a lot of money to go around. And it’s worth remembering that 10 years ago, Amazon was not an enterprise player at all.